The information contained in this website is for general information purposes only. 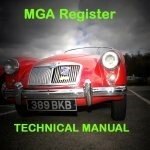 The information is provided by MG Car Club Limited and while we endeavour to keep the information up to date and correct, we make no representations or warranties of any kind, express or implied, about the completeness, accuracy, reliability, suitability or availability with respect to the website or the information, products, services, or related graphics contained on the website for any purpose. Any reliance you place on such information is therefore strictly at your own risk. In the interim, new articles are being written by MGA owners for the benefit of others and the best of these are listed below. Click on the title to open the article in a new window. No 20 Service and repair of the Lucas TPS1 turn indicator switch. Note: MGA Register can supply a replacement leather washer for this switch. Available through our Merchandise page.